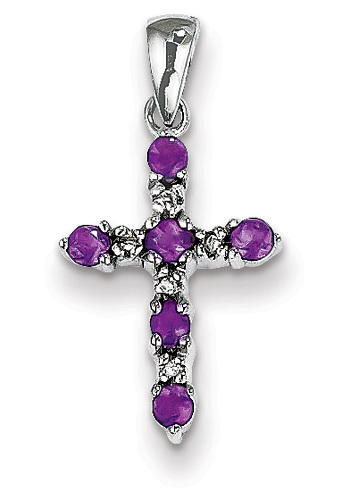 Prong-set genuine amethyst gemstone cross pendant in 14k white gold. Cross measures approx. 5/8" tall (13/16" tall with hoop) x 7/16" wide. Gemstone sapphire weight: approx. 0.20 Carats. Diamond weight 0.01 carats. View our unique collection of amethyst pendants. "And the third row a ligure, an agate, and an amethyst" (Exodus 28:19). We guarantee our Amethyst Cross Pendant, 14K White Gold to be high quality, authentic jewelry, as described above.